This is part two of my Cuba series. Click here for part one on Havana. 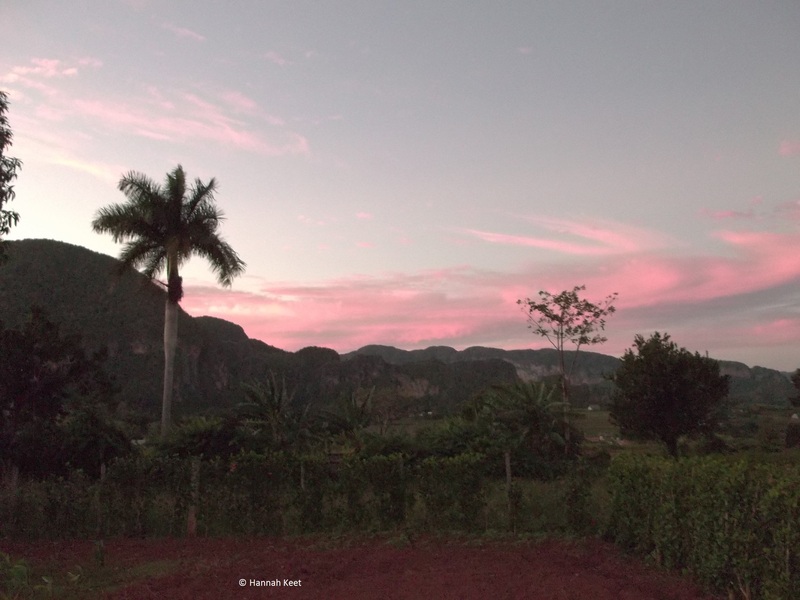 If the hustle and bustle of Havana gets to be too much for you, head west to Viñales. This peaceful village-like town has plenty to offer and is just over an hour’s drive to the beach (Cayo Jutias). There is a hop-on hop-off bus that goes around Viñales, but it wasn’t running when we visited. Not to worry though, if you have a chat to one of the taxi drivers milling around the main square (you’ll know who they are… “taxi… taxi lady… taxi?”), they’ll be more than happy to take you to see the sights at a price that worked out as just above the tour bus price for two of us. We were pretty lucky as our taxi driver had been working in the Pinar del Río province for many years and was more than happy to tell us all about the region. He also spoke impeccable English. Our trip included a stop to see the Mural de la Prehistoria, a bright mural painted on a cliffside depicting evolution; parking up at and exploring two major hotels for their magnificent views; a visit to the caves, where you clamber through to the bottom to queue for a boat trip to see carvings in the walls of the cave; and a trip to the local tobacco farm, where we met the Tom Selleck-esque farmer, who gave us a detailed explanation on growing tobacco and making cigars. He was more than happy to make one and let you try it out (I passed). 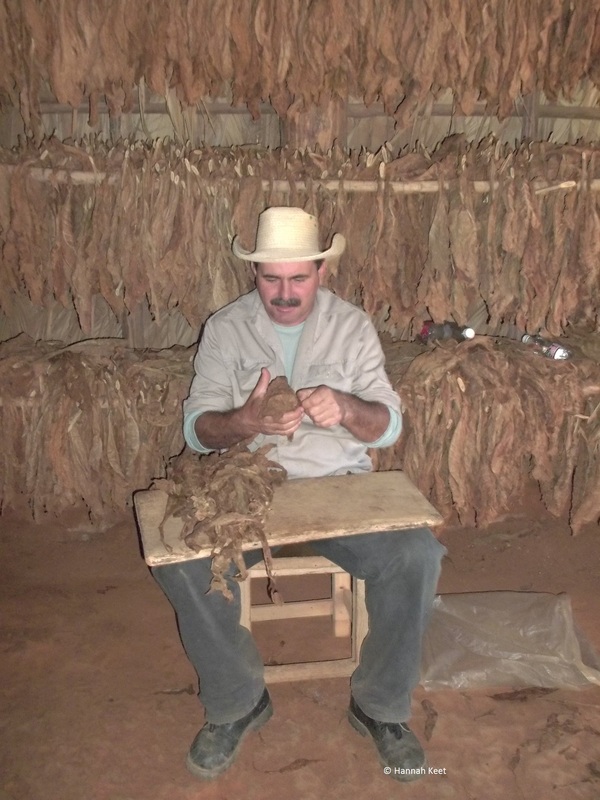 Cigars are also for sale here at low prices. The farmer also offered us rum (which I did try), all in exchange for a few CUCs. Our casa in Viñales (Casa la Musica, Calle: 1ra, % 2da y Sergio Dopico, #40, Rpto. El Progreso, Viñales) was run by the nicest family we met in Cuba. They are only too happy to call and arrange day trips for you and their food is to die for. When you walk around Viñales, you’ll see that restaurant prices are cheaper, but you get much more food in the casa, which makes it all the more worth it. I highly recommend staying in a casa particular. You’ll get a taste of real Cuban life and get to meet locals. They work really hard, they’ll help you with anything you need, and you can tell they’re genuinely happy to see you enjoy your stay in Cuba. The holiday simply wouldn’t have been the same if we hadn’t have stayed in casas. If you fancy venturing out to a bar in the early evening, I highly recommend Mogote Café (Pasaje Ceferino Fernandez #1, Viñales) just off the main square. There you will get inexpensive mojitos and piña coladas and you can watch the sunset in the most beautiful of settings. One of my highlights of the trip was going to the beach. 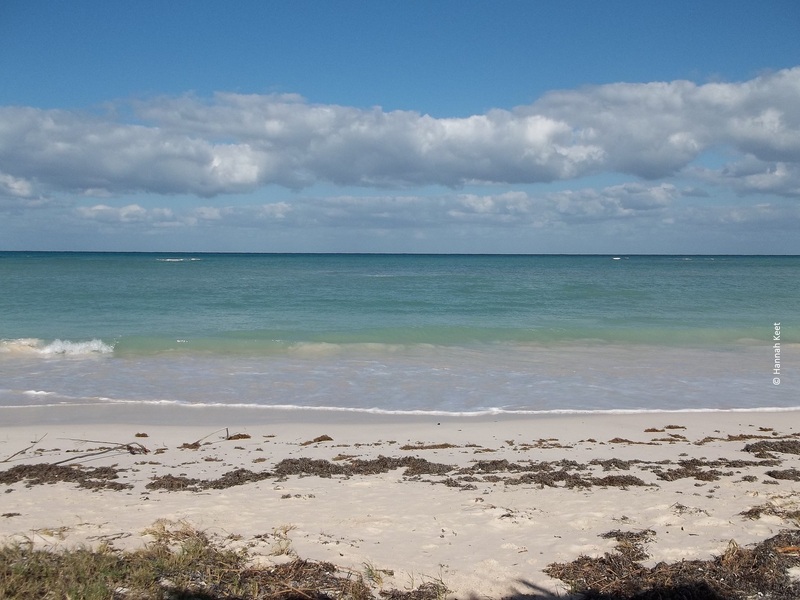 Generally speaking, the beaches were pretty empty as we visited in November. Although the weather was hot for us Europeans, the Cubans thought it was too cold, so if you travel in winter don’t expect to see locals frolicking among the tourists. The first beach we went to was the idyllic Cayo Jutias, just a short yet bumpy hour-or-so taxi ride from Viñales. Taxi drivers rent their taxis from the state and go to lengths to keep their taxis in good shape – including swerving around the myriad of potholes found on Cuban roads. This is something to bear in mind if you have a hangover, like I did that day. Book the taxi day before at the Cuba Taxi office on the main square and you can be at the beach by 10am and have a taxi waiting to pick you up at 4pm. Once on the beach you pay to use the sun loungers, but you also get people wondering up and down the beach offering you delights such as the coco loco: a whole coconut pierced in the top and filled with copious amounts of rum. Boat rides are also offered from this beach, but I was too busy topping up my tan and chilling out to go on one. Viñales also marked our first trip to the bank. Outside of the UK I’ve lived in two different German cities and in Luxembourg, and all I can say is: wow. Cuban banks are like nothing I’ve ever experienced before. In an effort to get a better exchange rate than the inflated airport offering, we thought it’d be wise to exchange a certain amount of money at a couple of banks throughout our trip. It would give us slightly more Cuban money and then mean that we wouldn’t have loads of CUCs to change back. In hindsight I’d say Cuban banks aren’t for the faint-hearted. Approaching the bank, we saw a group of tourists milling about outside – apparently in a queue, but with no visible beginning or end – and one very stern-looking Cuban. This person can only be described as the bank’s doorman. He’s the one who decides who gets seen next by the bank clerk. When this sombre man points at you, you don’t go straight to the available clerk. Oh no. You sit on the couch inside the bank and wait further. My advice (for British travellers at least) would be to take cash to Cuba, even though this entails risks of its own. I’ve heard rumours of certain bank cards being rejected by ATMs in Cuba; ring your bank before you go to check your bank is in no way associated with an American bank. When we travelled in November to December 2014, Cuba didn’t accept American bank cards, and could be funny with any bank associated with the U.S. If depending on your bank card for money in Cuba, you also have to bear in mind your domestic bank’s fees for withdrawing foreign currency. Make sure that any bank notes you take are as new as possible with no rips, tears or writing on them. Although I didn’t have any notes rejected, the clerk in this bank inspected all of my notes meticulously and did not look impressed. Another tip: make sure you get denominations of CUC 20* and lower. This woman gave me CUC 400 in CUC 50 notes. The average Cuban gets paid CUC 40 a month, so changing a CUC 50 note can be somewhat challenging!